Airtm is reshaping the concept of crowdfunding donation campaigns for humanitarian relief, and anyone, everywhere can help. See, with cryptocurrencies, value is no longer influenced by a government’s decisions, nor limited by isolated bank networks. Cross-border payments into Venezuela become easier, quicker and cheaper, helping accelerate external investment within the country, while providing access to more online-based opportunities. Anyone can participate, donating even pennies with their preferred cryptocurrency. At the forefront of cryptocurrency adoption, Venezuela is primed for widespread usage. LocalBitcoins, one of the largest over the counter peer-to-peer exchanges, moves over $20 million, equivalent worth of Bitcoin monthly in the nation. More and more individuals and store owners are accepting cryptocurrency payments, instead of devalued bolivars. Airtm, a globally accessible e-wallet used by thousands of Venezuelans daily, has become a popular alternative for holding, spending and sending value. It solves the “last mile” problem for distributing funds to Venezuelans, by building an active community of users, connecting local banking to international networks all over the world. And since it’s intuitive, free and fast, Venezuelans prefer using Airtm’s e-wallet to other forms of local and global payment methods, specifically for accessing funds received from abroad. Starting Tuesday, November 27, Airtm is launching AirdropVenezuela, a campaign to raise $1,000,000 equivalent in crypto-connected money for 100,000 ID-verified Venezuelans. Distributing $10 to each of the beneficiaries’ Airtm e-wallets, access to Airtm digital money introduces Venezuelans to income generating opportunities like freelance work, investment, donations, remittance and e-commerce, making it easier to purchase food, medicine and other scarce imported goods. Anyone can participate, donating even pennies with their preferred cryptocurrency, privately via Zcash’s (z-address), or AirUSD, transferring from local currency into Airtm. All donation addresses are listed at (and only at) AirdropVenezuela.org. Starting Tuesday, November 27, Airtm is launching AirdropVenezuela. 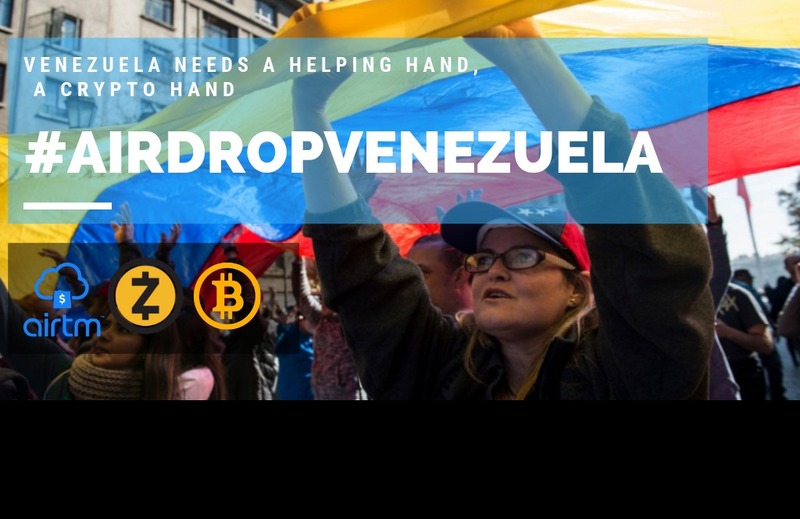 AirdropVenezuela is a unique opportunity for the global cryptocurrency community to unite and address a real-world need, helping real people with real problems. By promoting the use and adoption of cryptocurrency within a short period of time, we hope this campaign spreads cryptocurrency transactions everywhere. One of the largest untapped natural resources in the world isn’t Venezuela’s oil reserves, but its people. Airtm has the benefit of working with Venezuelans, both as clients and partners, and they actually designed and developed the AirdropVenezuela.org website. We hope this campaign will make a positive impact, and make it easier for them to participate in the global economy. Our goal is to inspire the global cryptocurrency community to donate to Venezuelans, extending their chosen cryptocurrency network to users with real world needs and use-cases today, while offering a lifeline where an apparent small amount goes a long way. Video instructions for donors (English). Video instructions for recipients (Spanish). This piece is part of our #Omichronicles series in partnership with Omipedia. If you want to help bring crypto to the masses, create an account here and share your knowledge! Pushing boundaries and rehabilitating fiscal infrastructure at Airtm.